I’d wager that I feel the cold more than your average twenty-something; it certainly shows. The skin on my hands gets cracked, my lips get sore, and I find myself reaching for moisturisers which are a lot, lot richer than my usual staples. 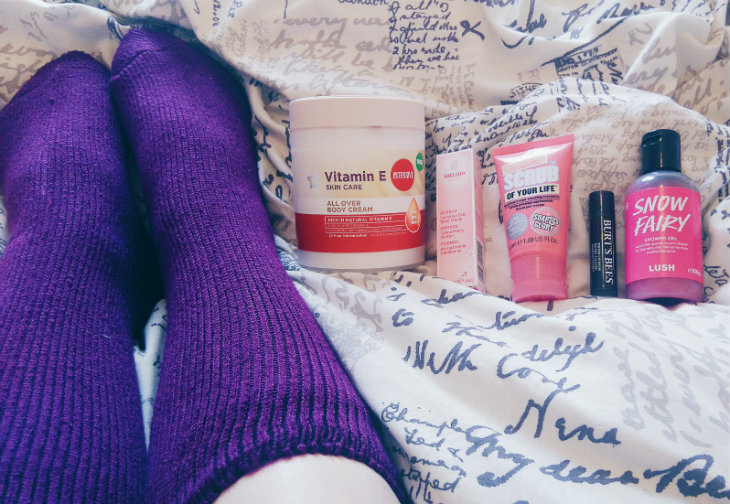 Winter products may be very functional, but they are by no means boring, so I thought I’d share some of my favourites with you. I never really accept any kind of clothing to review, but I had to make an exception for these because a) they’re fluffy socks, b) they fit with the theme of this post, and c) my feet get absolutely freezing in winter, so anything that can help is worth a go. Heat Holders are apparently eight times warmer than regular cotton socks, too, and while I have no way of measuring that, I can confirm they’ve been keeping my feet cost during the cold Welsh nights. I thought the wool was going to be itchy, but the lining is soft and fluffy — these are the most comfortable socks I’ve ever worn. The Heat Holders website, at £11.99 a pair. The extra-strength version of one of my favourite body creams has been a godsend. It feels exactly the same as its sibling – thick, non-greasy, quick to sink in – but the moisturising effects last for that little bit longer, and that can make all the difference. The tub is huge, so it’ll last you for ages; not bad for £3.49! My hands get terribly cracked and sore when it’s cold outside. The cream is gorgeous – it has a light, silky texture, but don’t let that fool you, because it leaves skin soft and smooth. Best of all, it doesn’t take forever to sink in, which means you can use it whenever you like and then go about your day. Plus, it smells of marzipan, so it’s more than suited to the winter season. I love a good body scrub, but I tend to want something a little less abrasive in winter. The Scrub of Your Life isn’t as gritty as Flake Away or The Breakfast Scrub, but it still does its job admirably, buffing skin gentle to get rid of flakes. I’ve yet to find anything from Soap & Glory’s bath and shower range I don’t like; they can do it all. A good lip balm is essential no matter what the weather, but I especially love this one because it leaves a lovely berry tint, and if berry shades aren’t wintery then I don’t know what is. The balm itself is very soothing for cracked lips and feels very moisturising. Low-maintenance lip care at its finest. To the shock and horror of, well, most of you, I hadn’t actually tried Snow Fairy until recently. And what a mistake that was. I bloody love it. It smells of cough syrup and cupcakes and doesn’t strip the skin of moisture — I plan to buy a bigger bottle before it’s too late. Dreamy. What do you reach for in winter? Do you feel the cold as much as I do? Let me know in the comments.